Workers who lived in containers now struggling to survive in Little India. By Deborah Choo. For 14 workers, formerly employed by Ocean Marine Engineering, being made to live in containers was perhaps the least of their problems. These workers have since been unemployed, and are now struggling on their own. When their company failed to pay their salaries for about six months, the men were unable to meet their basic three meals a day, much less remit money back to their families in Bangladesh. They rely on the once-a-day free meals that non-governmental group TWC2 provides at Sutha’s Restaurant at Cuff Road. 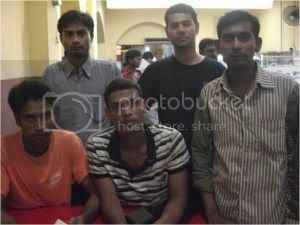 All 14 men had signed a two-year contract with their Bangladeshi agents, and paid S$9K each. They had been in Singapore for one and a half years. The workers have a salary and accommodation dispute with their employer. The case was brought up to the Ministry of Manpower (MOM) and a mediation session was arranged for the employer and the workers. However, the result did not turn out well. The Bangladeshis told us that during the session, the MOM officer and Ocean Marine’s representative mainly conversed in English, which left the workers clueless. After the negotiation, the employer agreed to pay the workers their salaries accordingly – with a clause; the workers had to sign a “salary voucher” which entitles each of them to receive part payment first. Each worker should receive payment ranging from S$1.8K to S$1.9K. This is the amount Ocean Marine owed the workers over a course of approximately six months. Due to their desperate situation, the cash-strapped workers collectively gave in and signed the document as they needed money badly. The document, however, is being kept by the employer. The second half of the payment has not been made. TOC has sought clarification with MOM on the amount the employer is able to charge the workers. Responding to TOC’s enquiry, MOM said that the amount must be taken in “totality” as it is “only logical”. This meant that for each worker, under the law, employers can only collect a total of not more than S$140 per container from the workers. Hence, each worker, if there are 20 housed in one container, can only be rightfully charged a maximum monthly fee of S$7 for accommodation, amenities and services supplied. The workers were subsequently shifted to another dormitory, but they have not been refunded for the money they’ve paid for living in the vessels. Another issue is that the workers had noticed that an amount of S$50 had been deducted for absenteeism, instead of the previous S$20 as agreed. According to the workers, there had been no mention of the fee increase until they saw the document during the mediation session on the 26th February 2009. When the workers confronted their boss, they were told that it was a “new rule”. The workers also complain of non-payment of medical bills by their employer. Under the law, employers are suppose to foot such costs. When Mr. Azmat Ali, 28, visited the polyclinic, he learnt that his boss had not paid his bill for his previous visit, two months earlier. He was thus told that he would not be given any medication until his previous bill from his first visit was paid. TOC understands that his employer has since paid the bills. When the workers report sick for the day, $50 is deducted from their salaries. Several workers had up to S$200 deducted off their pay in one month, even though they had medical certificates to explain their inability to work. According to the workers, they had repeatedly looked for the MOM officer who had mediated a settlement, but they were referred back to their employer. TOC tried to speak to the officer but she declined to comment. The workers are now living on their own in Little India. They have been jobless for approximately two months now. They had not been remitting money back to their home, and several revealed that ties with their families are strained. “My family also sometimes no happy, no talking,” said Mr. Mohamed Ismail, 30. They are not optimistic about the situation, acutely aware that they have a mountain of debts to clear. When asked what would happen if they returned to Bangladesh, Azmat said, “All men coming (to me), I don’t give (money), all men fight,” referring to his creditors. Ocean Marine’s representative could not be reached for comment. Their next mediation session with MOM and Ocean Marine is slated to take place on 18th March 2009.